Civilization Revolution 2, the newest iteration of the popular strategy game franchise for mobile devices, has launched on the App Store. Like the first title, Civilization Revolution 2 puts the player in the role of a popular ruler, challenging other factions as they attempt to advance their civilizations throughout the course of history in a turned-based format. 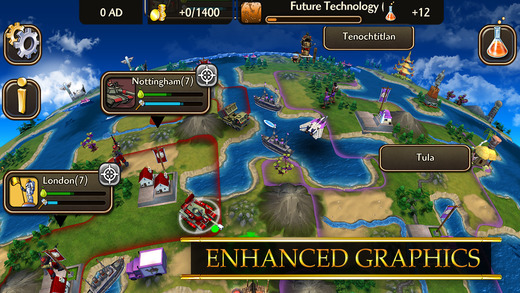 According to 2K, Civilization Revolution 2 is the first game in the series to be developed exclusively for mobile devices, as the original Civilization Revolution title came out on gaming consoles alongside iOS devices. 2K will also be releasing Civilization: Beyond Earth this fall on the Mac, which is a follow up to the popular Civilization V and Civilization IV. "Go to hell, freemium games! I'll gladly pay for it"
$14.99 is very steep for an iOS game, even for an A+ title. I think I'll wait till it goes on sale! Well, I don' have a problem with the price - if you ask me it's better that people get out of the habit of expecting iPad games to be super cheap, from the point of view of someone who wants console/PC quality games on them. This game, however, looks pants. I couldn't stand the original, with its irritating graphical and audio style and simplified, boring gameplay. I can see they've kept at least one of those. I really loved the original CivRev - I absolutely played it to death. I actually bought it twice - once for iPad, once for iPhone; that's how much I loved it. This new version is total pants. It is the exact same game as the last version, wrapped in a new and very, very awkward to use 3D shell. The selection and movement interface is really awful - you never really know what your tap is going to do (am I going to select the unit I tap on, or is there some other unit selected that I can't see and I'm going to command them to trek across the world to here?). That makes it really slow and difficult to actually play the game. At the same time, they haven't expanded at all on the limitations of the original CivRev. There are no new gameplay mechanics (like Religion) or more complex diplomacy options (like defensive pacts, alliances, or open borders), and you still can't destroy cities. This is clearly just a new skin on the existing, very old game. The AI is exactly the same; it's just as predictable as before. Every civilisation you meet will declare war on you - no matter how far away you are (even if you have no borders or are totally inaccessible from their region), how much bigger or stronger you are. It gets tiring quickly, and CivRev players learn to avoid other civilisations very quickly. That still happens in this game. In short: I am massively disappointed. This is a 3D skin update for the original, tired CivRev. It's actually been made a significantly worse game by the new control system. Save your money and buy the original - it's much more enjoyable. This game, however, looks pants. This new version is total pants. Anybody have an English-English dictionary? Yeah these guys crying about the prices are pretty lame. This is a game Not an app. A game that would cost 60$ on a console. And You cann get it for a quarter of the price and multiplatform. Playable for the rest of your lives without needing any console . Initially the price seems off-putting; but if that's the total amount you'll ever need to pay then actually I fully support it. Pre-mobile apps this would have been a very good price, e.g. on a DS or console. And if it means no in-app-purchases to unlock technologies or units then I'm all for it and hope that it's a success so that the same model is used elsewhere (I'm looking at you, Plants v Zombies 2!). Looks good! $15 is not an issue. Sorry folks, if you can't pay, then you can't play. I started playing Asphalt 8 and Plundernauts recently. Both freemium, both good fun. I even bought some IAP in A8 to support the developer even though it wasn't necessary to progress. Then A8 introduced 'cooldown' timers to force you to buy currency. Goodbye A8. Plundernauts is worse - I'm waiting over 3 days for my ship to be ready, while others report 10 day waits? Aren't games supposed to be FUN? You can buy currency packs - up to 90 euros in Plundernauts. Buying cars in A8 can cost up to 70 euros. Just for one car! Give me a quality 15 dollar game any day! Huh? PvZ2 is a model of how to do freemium right. I've spent a grand total of £0.00 in that game and I've completed all of the content to date. In fact if there's anything wrong with the game, it's that it's just too easy to beat and unchallenging. So there's no incentive to actually spend $/£/ for boosts etc. I don't like the idea of "cheating" in games which is what fermium purchases sometimes feel like. If it's a game I really like I'll often play it all the way through first before I buy anything (as a sort of donation to the developer) before I delete it. This. I just wish there was a way to play a demo.